Well, Eurodollar finally managed to rebound from level of 61.8% and may be starting new bearish trend right now. During local correction, I opened another sell order. Target is in lower area, close to 1.3200. As we can see at H1 chart, pair is starting new correction, which is unlikely to be very deep. Probably, pair will rebound from local level of 38.2% and start new descending movement. 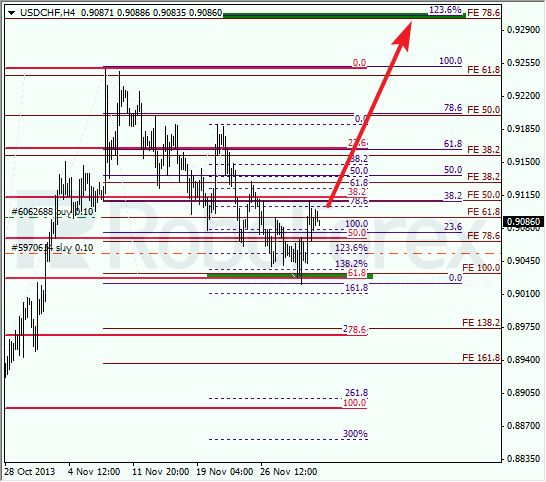 Franc rebounded from level of 61.8% and bulls returned to the market. After completing local correction, price is expected to start new ascending movement. 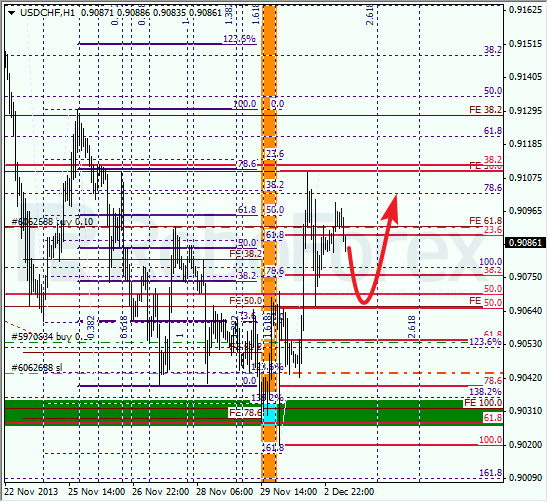 Target is in upper area, close to 0.9300. At H1 chart, price rebounded from lower levels right inside one of temporary fibo-zones. During the day, pair may form local correction towards level of 50%. If market rebounds from it, pair will continue growing up.